NEW YORK—Hawk Newsome says he often makes it a point to meet people where he grew up. 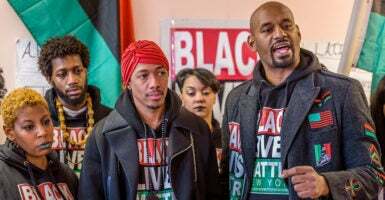 So on a cold day not long ago, I made my way to Papa Juan’s Cigar Room in the South Bronx to see the man who led Black Lives Matter of Greater New York. It really wasn’t scary, but it certainly was outside of my comfort zone. 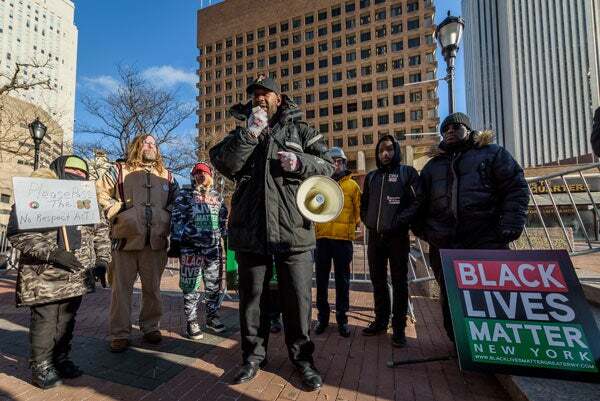 Describing himself as a devout Christian and family man, Newsome shared stories with me about his youth and why he was motivated to become a civil rights activist and organize Black Lives Matter of Greater New York. Then, in September 2017, he made headlines when he took the stage at a pro-Trump rally in Washington, D.C.—and won over the crowd. Today, he’s focused on studying for the bar exam and starting a new organization with the goal of finding common ground. Our interview runs about 40 minutes and is featured on The Daily Signal Podcast. An abridged and lightly edited transcript is below. Conservatives won’t agree with Newsome on many issues, but I hope you’ll appreciate the opportunity to hear a different perspective. Leave a comment and let us know. Rob Bluey: Let’s go back to that day last year when you found yourself at a pro-Trump rally and ended up on stage. How did it all happen? Are you kidding me? Put it in a museum. So, we went down to protest the statue. There were armed pro-Confederate white nationalist types there. It turned out to be a dud, because not a lot of them showed up. They left really quickly. Hello? Black people built this country for free. We’re heavily vested in this country. “Hello, you need to acknowledge that,” even though the history books don’t. So, they invited us on stage, and I was hell-bent, and I use that word strategically. I was hell-bent on going up there. Bluey: And you’re wearing your Black Lives Matter shirt, correct? Newsome: Yeah, wore my shirt and a hoodie. Bluey: So, you’re clearly stating your views, literally, on your chest. Newsome: Absolutely. On my chest, right on. I go, we go onstage, and on the way up onstage, it was like the skies opened up. I know a lot of people won’t accept this, but those who have God in their heart, who have some sort of spirituality, will understand what I’m saying when it was, like, the sky opened up. A voice came down, and it said, “Make them understand who you are.” So, what that meant was, don’t go up there, and curse them, and damn them all, but make them understand why we’re out here fighting, why we march, why we do this work. And that’s what happened. That’s what happened. Bluey: You could have stood on that stage, said some things to rile up the crowd, and fuel their anger, and instead you didn’t. You chose a different path, and they embraced you in many respects. Tell us what that message was. They went bananas, like applause. They went from booing to cheering us on, in a matter of three minutes. Newsome: He said, “No, they came up here. They’re going to say their part.” That was honorable on his part. These are these moments … that will change the world. Now where we have to get to is, where all of those cops come together and say, “I’m not working with this scumbag anymore. Fire him, or we quit.” That’s, that’s when the change occurs. Because everything is so polarizing. Everybody’s on these teams, and they can’t concede to anything, but could you imagine if police officers in these precincts actually started speaking out against these cops? Then you could call a cop a hero. Then people like me will say, “That was a heroic act.” So, yeah, that was that story. I also said on that stage at the Mother of All Rallies, “I’m a Christian.” Everybody started clapping. Like, “Yes, I’m a Christian. 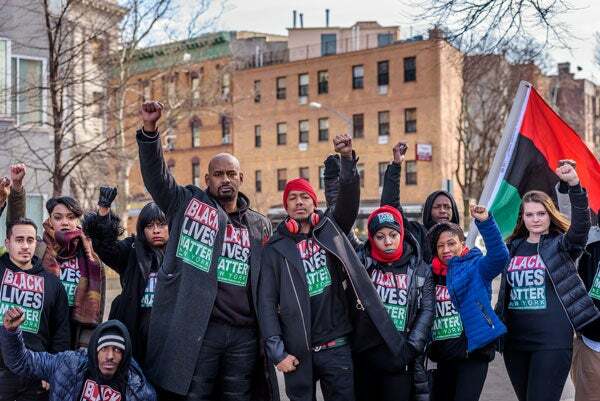 Black people, activists, are Christian. Check your Bible. Jesus Christ was a radical revolutionary. He fought against the government. The police arrested him, and crucified him. “Think about your Bible. … Like, Jesus was an activist who was crucified.” Whatever, but it makes sense, right? I said, “I don’t know if your Bible is any different from mine, but it says ‘Love your neighbor,’ and that doesn’t mean that your neighbor has to be from the United States of America. When people hear this, they’re going to go crazy, but I do … People who are facing persecution, people who have been in this country for 20 years who have been working hard, that have established themselves. Kids that grew up in this country. They have a right to be here. If it was your family, you wouldn’t say, “Kick them out. Throw them away.” No, you wouldn’t say that. So, what people need to start doing is putting themselves in other people’s shoes, but for some reason the government, these politicians, have convinced us that we should not do that. That’s how they maintain power, because they keep us at a odds against each other. As far as I’m concerned, it’s people against government. I’m not talking about Democrats; I’m not talking about Republicans. I’m talking about people against government. Hillary [Clinton] hates Donald Trump, but they used to party together all the time. Spare me. Spare me. So, if they would have listened to our cries in the summer, when this taser was pointed at this young person who was being held by her dad, then the police wouldn’t have pointed a taser at a woman holding a 1-year-old a few days ago. I’m calling her grandmother after I finish this interview, and try and get some bail money for her. You got to understand, a lot of these people are right. … A large number of people who get killed by police, who are subject to police brutality are criminals. No one’s disputing that, but criminals have rights under that divine piece of literature that we call the Constitution. Bluey: That’s right. Well, Hawk, let me ask you this, because I agree with what you’re saying about how politicians tend to divide, and want to perpetuate that, because frankly, that is how they stay in power in many cases. Yet, you and I probably don’t see eye to eye on many issues, but here we are having a civil conversation. What advice do you have for others, how they can go about engaging in this outside of, perhaps, the political spectrum to get things done? Newsome: I work with a group called One America. Rabbi, gay, straight people, Christian, white, black, Persian, Latin, you name it. Men, women, you name it. What we do is encourage these conversations. But what I’m thinking about doing is starting a GoFundMe, and doing a national tour to get people who are at odds against one another to just sit down and talk. We’re not here to argue whose philosophies or theologies are better, but just to talk. To figure out what we agree on. We call it a “common ground” tour. Do you think people would donate to that? Bluey: I think so. I think there’s some groups out there that are trying to foster that. You talked about this new organization that you’re creating. What’s next in your life? What would you like our listeners to know about where you’re heading next, and what you hope to accomplish as we head into this new year? Newsome: Well, I graduated from law school in 2012. I took the bar [exam] a few times after and failed it. Not as many times as John Kennedy Jr., but I failed it a few times, and I haven’t taken it in about three years, so I’m currently studying for it. I’m taking it in February. What I want you all to do is pray for me, because if you know me and you know my work, it’s hard for me to sit still. I’m kind of like an action activist junkie. I need to be out there screaming, chanting, applying pressure. This is what I live for; so, me sitting down for 10 hours a day and studying, it’s extremely hard. So, I’m taking the test. I’m going to keep having a great time with my kids and my family, but Rejuvenation … . I want to breathe life back into a lifeless people. This division for this is bigger, it’s like where the Black Panthers meets the NAACP. It’s activism, yeah, but that’s secondary. We want to teach people how to love themselves, how to support themselves, how to be better human beings, organizational skills. This type of program benefits anyone it’s applied to, but I think black folk need it. Just look at studies. People talk about violence. It was a prison study that Dr. Mark Hyman, someone who I hold in a high regard, he showed me. This study said that violence in a prison was cut by 40 percent when they introduced a clean diet to these folks. And then, when given a daily supplement, violence went down another 15 percent. So, I think that a lot of our problems spur from what we eat, and our mind state. Trauma is real. Actually, Jesus talked about … the Bible talks about meditating. So, I want to bring meditation into our neighborhoods, because people have a lot of stress that they need to deal with, and meditating will help them tremendously. Rejuvenation is the future for me. I’m going to turn this organization over to my protege. Her name is Nupol [Kiazolu], that’s the one that I told you about earlier. She came into Black Lives Matter-Greater New York, about two, three years ago. Trauma, domestic violence in the home. She was abused as a child in many ways. She didn’t have a voice. She was active, but she didn’t really have a voice. She grew in this organization, and now she introduces me as her Pop. I’m adopting her. She’s 18, so it’s paperwork, but I’m adopting her. 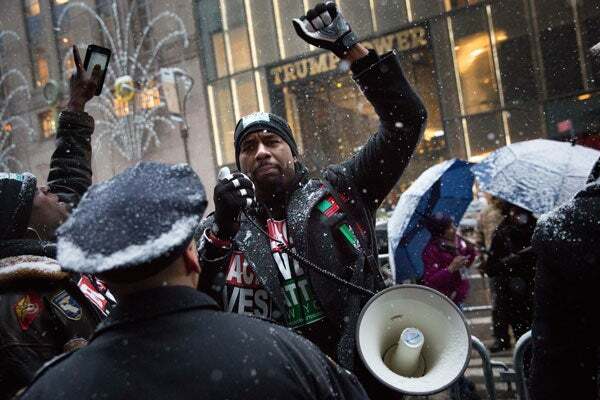 Think about this, the leader of Black Lives Matter-New York, one of the leaders of Black Lives Matter nationally, had a young woman come into his group, 15, 16, raised this young woman up, nurtured her, supported her, guided her, and now he’s adopting her. This is the type of work product that we’re putting out. It’s all a labor of love. … This is my child, and calls to talk about things, strategy, talk things through. This kid is a monster. You think I’m a problem to this thing that we call white supremacy? When she arrives fully—oh, my God. She might deliver the knockout blow. Bluey: Well, hopefully we’ll have a chance to meet her, and perhaps do an interview with her down the road. Hawk, I want to thank you for taking the time, speaking with The Daily Signal today. It’s been a pleasure. Newsome: Thank you. Thank you. I appreciate your time, and thank you for coming to the South Bronx—South, South Bronx.